30/365 – “Habemus Papam” nr.2, a photo by Luca Rossini on Flickr. 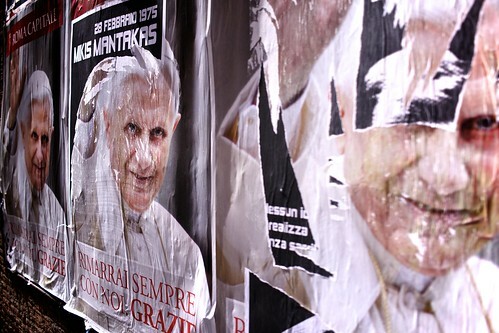 The very first effect of a new Pope to the city of Rome is the quick and inevitable disappearance of the former Pope. 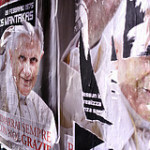 These posters were the last public appearance of Josef Aloisius Ratzinger into the streets of Rome, and the last ones still in place are now rotting on the walls. The religious souvenir shops have to get rid of the tons of magnets, miniatures, posters, calendars, incisions, coins, stamps, busts, and whatever amenities portraying the former Pope Benedictus XVI, and to replace them with a whole new set of souvenirs with the new Pope Francesco on them. Also, let’s be honest, Pope Giovanni Paolo II got beatified quickly after his death, so the souvenirs kept and will keep selling for quite a while, but Josef Ratzinger is still alive, and not really close to be beatified anyway. So, I don’t really see a long lasting market for his portraits, if anything that market has already vanished today. I’m really curious to see how long it will take for the new Pope to make his appearance in the souvenir shops. Posters and postcards will probably be the first items to show (and sell) his face, just because they are rather easy and quick to produce, but I would bet my whole fortune (for as small as it is) that there are many fabrics which have already started the “conversion process”, applying as many modifications as possible to convert their Ratzinger miniatures or busts into Bergoglio ones.